I am in love with sprouted spelt. I feel it is a superior flour. Everything I make with it turns out softer and lighter than with wheat, kamut, or emmer wheat. I also love it because my gluten-sensitive family members can eat it, due to the sprouting. These tortillas are fantastic right out of the pan (what tortilla isn't?). You'll want to wrap them warmly in towels to keep them from drying out. Once cooled to slightly warm, transfer to a zipper storage bag to preserve moisture. They will stiffen up, but don't be discouraged. A few seconds on medium heat in a cast iron skillet is all that's needed to soften them up for subsequent meals. In bowl of mixer, combine flour, baking powder, and salt. Turn mixer on dough setting and add oil. Add water gradually until mixture cleans sides of bowl and forms ball in center of bowl. Let the machine knead the dough for 2 minutes. Remove dough. Divide into about 17 2-inch balls. Roll each part into a ball and fill an oiled clean mixing bowl with them. Cover the bowl with a moist towel or plastic wrap, to keep them from drying out. Heat a flat cast iron frying skillet over medium heat and add a small amount of oil. Oil a clean, flat work surface, such as a countertop. With an oiled rolling pin, roll out one ball of dough into a circle that is approximately 1/8-inch thick, or your desired thickness, and about 10 inches in circumference. Place rolled out tortilla in the pan. Let it cook for about 25 seconds or until there are several bubbles in the dough. Flip the tortilla with a spatula and cook the other side for another 15 to 25 seconds, or until the bubbles are browned*. Remove tortilla from pan and place between towels to stay warm and moist. Meanwhile, roll out the next tortilla. Repeat until all of the balls have been rolled out and cooked. Add oil to pan and/or rolling pin as needed. Store in a zipper seal freezer bag in refrigerator or freezer. I don’t believe this is a cross contamination issue. When sprouted, the grain still contains gluten. At least I think it does; I’ve never read otherwise, and kneading sprouted grain flour gets elastic as if the gluten were developing. My daughter and my husband are sensitive to gluten, my daughter moreso. Her symptoms are primarily digestive. I couldn’t say whether she has celiac disease or not (she didn’t have the official test, but rather a food allergy test), but I would say she is NOT because of her favorable response to sprouted grains (and we have been watching carefully). The sprouting (or soaking) aids in pre-digesting the grain, so the sensitive person may be able to handle that grain. Since I know she is sensitive to gluten, we are choosing to use the older gluten grains such as spelt, kamut, and emmer wheat. They’re not the hybridized wheat varieties of today that are so high in gluten content. I can’t say for sure whether or not you could eat these things, but I think it is worth a try. I don’t think your nutritionist really understands the issue if he is mentioning a cross-contamination possibility. That suggests that he thinks sprouting could eliminate gluten – I’ve never read that this is so, nor has my goal been to eliminate gluten. Our goal has been to help the process along through a traditional food preparation method. I know I spend much time lately talking about Nourishing Traditions. Well, I’m convinced that the modern world (since food became an industry) has erased proper methods of food preparation from our culture. Before food industry came along, just about everything was at least soaked before consumption – this could be why there are so many food allergies nowadays. People aren’t fixing their food properly. It may be whole and organic, yes, but it is prepared too quickly and therefore, wreaks havoc on our bodies. Please let me know if any of this doesn’t make sense – I admit that I am learning it myself. I certainly would love to continue talking to you about it. I also am very curious if it would work for you. How severe are your gluten sensitivities? I understand your concern. In fact, I held off for months before I tried sprouting grains. I don’t intend to pressure you at all. I have no idea if what worked for us will work for many people. So what do you think makes it work? The enzymes that are created help break down the gluten? 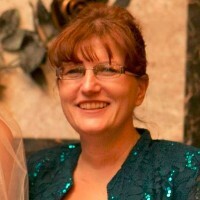 Sara Kay – yes, I think that is exactly it – the enzymes help digest the gluten, once it is in your body. But even more, the sprouting partially breaks down the gluten, before it enters your body. I just ordered a book called, Essential Eating; Sprouted Baking, and I hope to learn more about this process from the book. It’s definitely food for thought, isn’t it? A whole new world is opening up to me. All these years, we’ve been eating healthfully and working around food allergies, and now I see that even though I’ve been using the best of ingredients, I haven’t been preparing everything properly to maximize nutrition and to reduce stress on the digestive system. Sara Kay – I enjoyed our chat very much! I tried a half batch of these yesterday (only had 3 cups of sprouted spelt flour to work with), but I think I must not have used enough water, because the tortillas were crumbly and broke apart during the cooking process. Can you give an idea about how much water you use for a full batch? I know it probably will differ according to climate/humidity, etc., but I was just wondering what a target amount might be. Oh, no! I left the water out of the recipe. It should call for 2 cups (for the whole batch)! I am SO SORRY! No problem, Wardee! Now I know—both from experience and from your updated recipe—that lack of water was my problem. I probably only used about a half cup for my half batch. Also, my mixer doesn’t have a “dough” setting. What speed do you recommend? Somewhere in the middle? Also, should I use a dough hook rather than my regular mixing paddle, do you think? Finally, how long do you usually grind your sprouted spelt in your Vita-Mix? I felt like my flour was maybe a little bit coarse—not soft as you have described in several posts—so I probably didn’t grind it enough. Sonya – On the Bosch, I use speed 2, but any speed will be fine. Spelt’s gluten is more fragile than wheat, so overkneading is more of a possibility. It would be better to use a medium or slow speed, rather than high, I think. Yes, use the dough hook. I grind the spelt for 1 minute, 19 seconds on HIGH. I always grind longer than VM recommends, but I never grind more than 2 cups at a time. Have fun – and again, I am sorry for the poor first experience! On vacation the other week I had breakfast burritos and they were yummy! 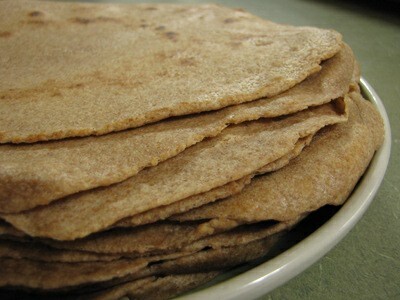 So then I decided I wanted to make some, but I needed sprouted tortillas. Those are super expensive to buy so I needed to make them (I already bake other sprouted foods). I tried a recipe over the weekend and it just didn’t work. The tortillas were dry, coarse and just didn’t taste good. I found your recipe and decided to try it. YUMMY! I would add just a pinch more salt, I think. And I rolled it too thin, which made it difficult to get into the pan. But I think I could perfect my technique and then this would be perfect. I can’t wait to have super yummy breakfast burritos made from these awesome sprouted tortillas in the freezer all the time. I changed tonight’s dinner plan to quesadillas just so I could eat more of these! I bet they’d be yummy with butter and cinnamon sugar too! I have about 3,000 pounds of regular kinds of wheat (soft, hard, white and red) in my food storage. I would like to use it up. Wouldn’t sprouting it help it to be much better nutritionally? I have made whole wheat bread all my life thinking it was healthy for my family. Now I’m learning new things. Thank you 🙂 ! What is the nutritional information on these spelt tortillas … per tortilla. Thanks. Thanks for your comment. We don’t calculate the nutritional content of any of the recipes on here. These are good tortillas! I made them tonight and used them for smothered burritos.